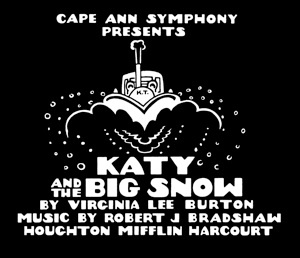 Inspired by Virginia Lee Burton’s Katy and the Big Snow and commissioned by the Cape Ann Symphony. Robert J. Bradshaw’s third suite for orchestra was commissioned by the Cape Ann Symphony in honor of Virginia Lee Burton’s 100 birthday year. The Cape Ann Symphony began 2009 by premiering “Katy” and supporting Houghton Mifflin Harcourt Publishers’ year-long celebration of Burton and her wonderful books.. The performance included newly composed orchestral music by Robert J. Bradshaw, narration and a multimedia presentation of Burton’s original illustrations on a 40 foot screen. For a brief video about the project, CLICK HERE. To watch the complete premiere performance, CLICK HERE. Bradshaw, a resident of Cape Ann (as was Burton), visited thirteen schools teaching children about music composition. This site was designed to assist young listeners in learning to appreciate orchestral music. A sister sight integrates storytelling into all areas early education curricula. Sharron Cohen created a wonderful resource for teachers and students. CLICK HERE to visit the curriculum pages. It should be noted, that although a close correlation is made between the form of the composition and the book, Suite No. 3 is a separate entity entirely and is in no way intended to reiterate what Virginia Lee Burton or Houghton Mifflin Harcourt have published. This musical work represents the composer’s life-long connection with the book and is a very personal expression of his individual creativity - inspired by his children. Thank you for visiting! Please, take a look around. If you have any questions, please feel free to email the composer by clicking here. No part of this web site may be reproduced, altered or transmitted in any way or by any means except for personal use or by teachers for classroom instruction. All information and musical examples are governed by Federal Copyright Law. Every effort has been made to obtain licenses, permissions or use materials in the public domain when creating this site. If any part of this site is identified as being under restricted use, please email this information here and the element will be immediately removed. Thank you!